Actually very little is known about Harry Fitkin. He was born in 1892 in Hertford, Hertfordshire, the son of general labourer Charles Fitkin. Harry was married in the winter of 1913 at Hertford to Dora Parsons and, after their marriage, they moved to 32 Mount Pleasant, Yeovil. After the outbreak of war (and judging by his Service Number 506776, in 1917) Harry enlisted in the Army. He became a Driver in the 2nd (Wessex) Field Company TF, Royal Engineers. In 1917 Field Companies were raised for the last regular (27th, 28th and 29th) Divisions. Orders were given by the War Office to form three more regular Divisions from the last units recalled from overseas garrisons. As the regular Field Companies had all by now been allocated, arrangements were made for nine Territorial Field Companies to fill the places in the three new Divisions. The Companies were given numbers in February 1917 and the 2nd (Wessex) Field Company TF, joined 27th Division and became 501st Field Company, Royal Engineers. The Royal Engineers carried out a number of different roles for the army both in the battlefield and along the lines of communication. The various specialisms were organised into different types of units, none of which was bigger than a Company in size. These units were attached to Divisions, or to larger formations at Corps, Army or even GHQ. The main ones, of which there were many, were the Field Companies and the Signals Companies. As they were attached to the fighting portions of the Divisions, these Companies often saw action and took part in the fighting. The Field Companies relied on horses for transport and had an establishment of 17 riding horses for the officers and NCOs of the Mounted Branch, plus 50 draught heavy horses, and 4 pack horses. There were also 5 spare draught horses as replacements. With the exceptions of the Trumpeter and Bugler, all other ranks were armed as infantrymen, carrying the SMLE rifle. Hostilities with Bulgaria ceased on 30 September, with the Division by then in the area Kosturino - Rabrovo - Cestovo. The Division continued to advance and passed Krupnik by the end of October. 27th Division was ordered to halt and turn about on 2 November, embarking in December for operations on the Black Sea. I lost track of Harry Fitkin but he died on 9 December 1918, aged 25, and was interred in Kirchkoi-Hortakoi Military Cemetery, Greece. The cemetery was begun in March 1916, but it remained a very small one until September 1917, when the 60th, 65th and 66th General Hospitals came to the neighbourhood. In June, July and September 1918, other hospitals were brought to the high and healthy country beside the Salonika-Hortakoi road and in September 1918, the influenza epidemic began which raged for three months and filled three-quarters of the cemetery. It is most likely, therefore, that Harry was one of the last to die in the influenza epidemic. 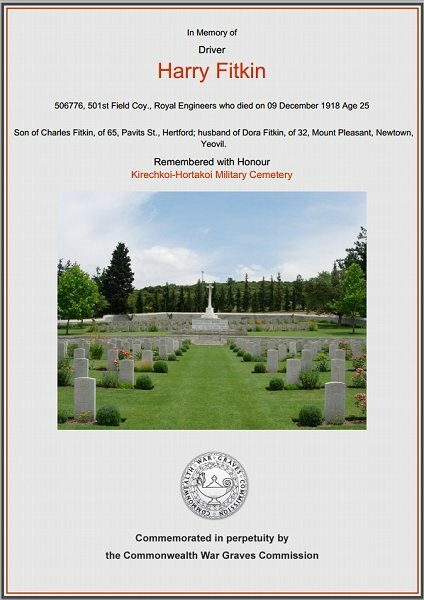 Harry Fitkin was buried at the Kirchkoi-Hortakoi Military Cemetery, Greece, Grave 556. His name is on the Yeovil War Memorial in the Borough, albeit as Fitkin, L rather than Fitkin, H.
The Commonwealth War Graves Commission certificate in memory of Harry Fitkin.